Plastic case manufacturer W.AG Funktion + Design publishes the new catalogue in print and digitally. The catalogue for the year 2019 offers a multitude of new application examples around case solutions from a variety of industries. 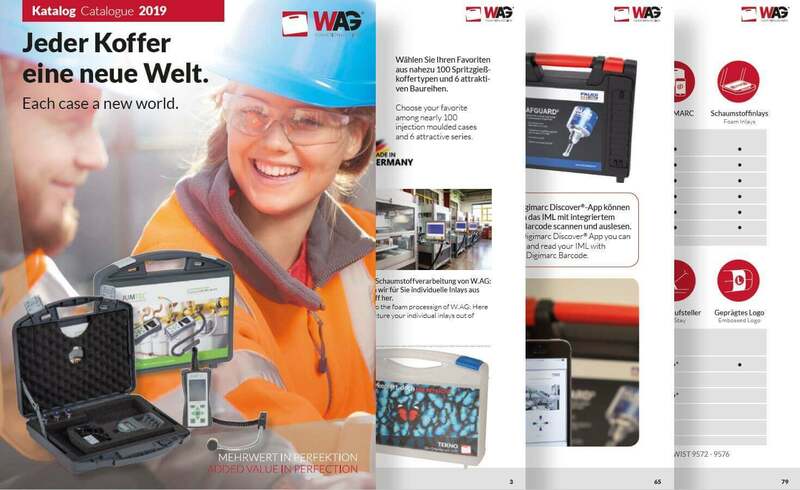 As in the previous year, the catalogue comprises 100 pages of concentrated “case power made in Germany” by W.AG. In 2019, the catalogue for the first time includes new icons designed to make it easier for users to navigate between industries, plastic case features, design options and foam inserts. Pages 96 and 97 provide a list of icons for an overview of the complete range. On page 3, the catalogue 2019 offers insights into the product portfolio and production areas of W.AG. In addition, W.AG announces a new feature on this page: During the course of 2019, digital direct printing will be introduced to expand in-house capabilities. As a result, small batch jobs can be printed and completed with images and colour gradients. We live in times of constant change and therefore the new catalogue also features three new industry groups with interesting real world examples: health / lifestyle / leisure, security / protection / defence and learning / education / IT. Each industry group presents itself with its own double page and numerous plastic case solutions for the respective area. Great care was taken again this year to provide the reader with additional useful background information. A new feature overview on pages 78 and 79 shows the available features for each series. In addition, the available features have been listed in greater detail in the dimension table pages (p. 84 through p. 95). Take a moment to discover the product and service worlds of W.AG Funktion + Design. Order your free hard copy without obligation via our contact form. In addition, the catalogue is available digitally as a PDF file in our download area or via the following link: Download catalogue 2019. The W.AG team wishes you a lot of fun discovering!